John Morgan is a descendant of Dr. Gerrit P. Judd, a missionary physician and trusted advisor to King Kamehameha III. The Kualoa Ranch legacy began when Judd purchased the ahupuaʻa of Kualoa from the king in 1850. Judd’s son, Charles, then bought the ahupuaʻa of Kaʻaʻawa and Hakipuʻu. The now 4,000 acre ranch is a Private Nature Reserve as well as a working cattle ranch whose mission is to preserve Kualoa’s sacred lands and celebrate its history. In 1971, Morgan began working at the ranch as a teenager. Ten years later he became manager. He started a diversified outdoor recreation operation at the ranch in 1985 and since then, Kualoa Ranch has grown to employ 360 people. Its primary endeavors are cattle ranching, diversified agriculture, outdoor recreation, education and real estate. Morgan has spent the great majority of his life overseeing the ranch, guiding diversification efforts and living the values of mālama ʻāina. While under his leadership, Kualoa Ranch has been seen by many as a model of stewardship; managing a private asset while striking a balance and keeping the best interests of the community in mind. Morgan was raised in Kualoa and attended Punahou School. While in high school, his family house was condemned to create what is now known as Kualoa Park. He attended Oregon State before returning home and enrolling at the University of Hawaiʻi at Mānoa where he took classes like Hawaiian language and agronomy, while continuing to major in Economics. Since then, he has been honored by numerous local and national organizations for his stewardship and leadership acumen. Of note, he was recognized as American Savings Bank Business Leader of the Year & National Cattlemen’s Beef Association Environmental Stewardship Award. Morgan is an avid outdoorsman who loves to hike, horseback ride, ski, golf, surf and mountain climb. He married his college sweetheart, Carri Kahn, in 1981 and they have three children: Jason, Kyle and Lindsey. They also enjoy being grandparents to three grandchildren and are eagerly awaiting one more. 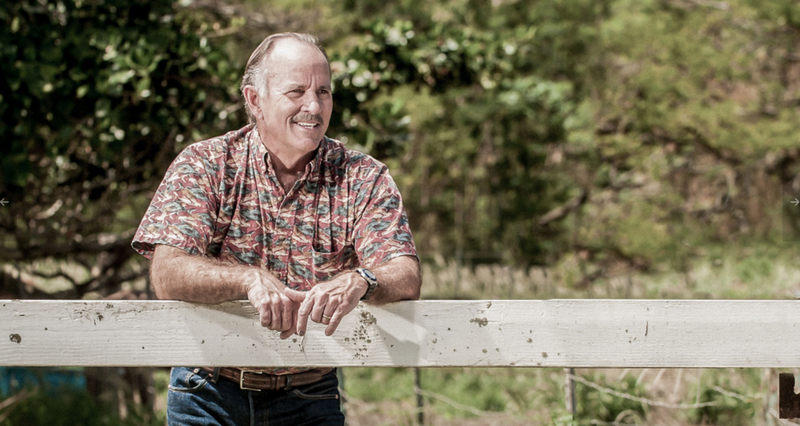 How do you balance traditional values and innovation at Kualoa Ranch? Everything we do must fit into a mālama ʻāina vision. If it (a new idea or venture) will enhance our ability to care for the land and honor the culture, we can consider it. If it doesn’t, we shouldn’t. Not only did it enable me to meet new people, learn more about and experience important facets of our community; it helped build my leadership abilities. What’s next for you? The Ranch? We are always trying to think of something new to do, some new crop to grow or new experience to provide for our guests. We are also trying to make a better workplace for our employees. One of our projects for 2019 is to launch a nature based child care center for kids of employees. For me, I hope the surf is good next week… and the week after… and the week after that. Seriously, I want to stay active. Besides that, and spending time with my wife and family, I need to find and groom a successor. My father told me a long time ago: You are either improving or getting worse, there is no staying the same. The choice is yours and it is up to you to make it happen. This applies to everything in life. I hope to be remembered as a curious, fun, wise, thoughtful and caring person. I would also like to be remembered for helping to re-create Kualoa Ranch, into a model of sustainability that will endure for generations.